Looking for a simple go-to side dish to pair with your steak, grilled chicken, shrimp scampi, pot roast, or broiled salmon? This is it! 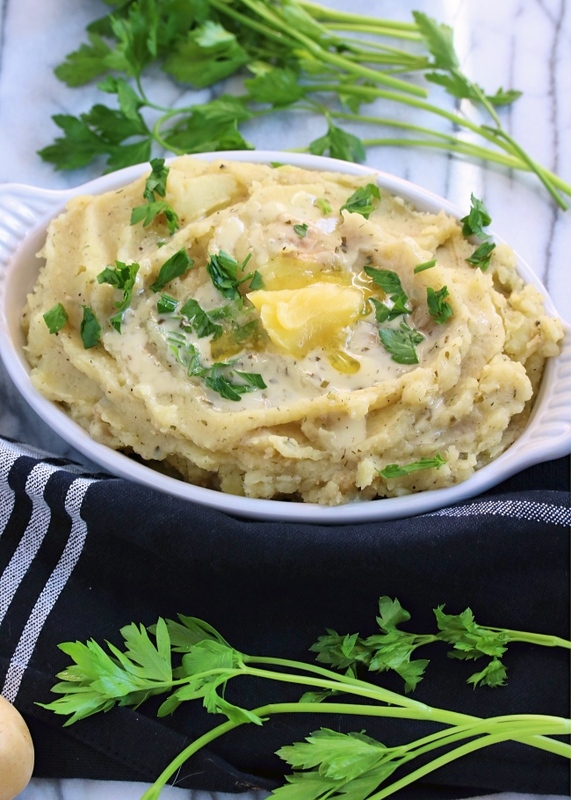 Easy mashed potatoes with tons of flavor & the perfect creamy texture- yet Paleo friendly & Whole30 compliant! This recipe has been a long time coming, you guys. It's one of those that I've made dozens of times on a whim- but without ever writing anything down. Some days it came out perfect, others I felt like it wasn't "quite right". So I finally took the time to truly test the ingredients & nail down some exact measurements- and here we are. I am SO proud of these potatoes! Does that sound dramatic?! Okay maybe, but seriously- I have to stop myself from eating the entire dish! They are that good. To take it to the next level, I drizzled with a little Primal Kitchen Foods ranch dressing over top for serving and added a little extra ghee (never enough when it comes to potatoes). You can skip the ranch all together, though- there's plenty of flavor in this dish without it! 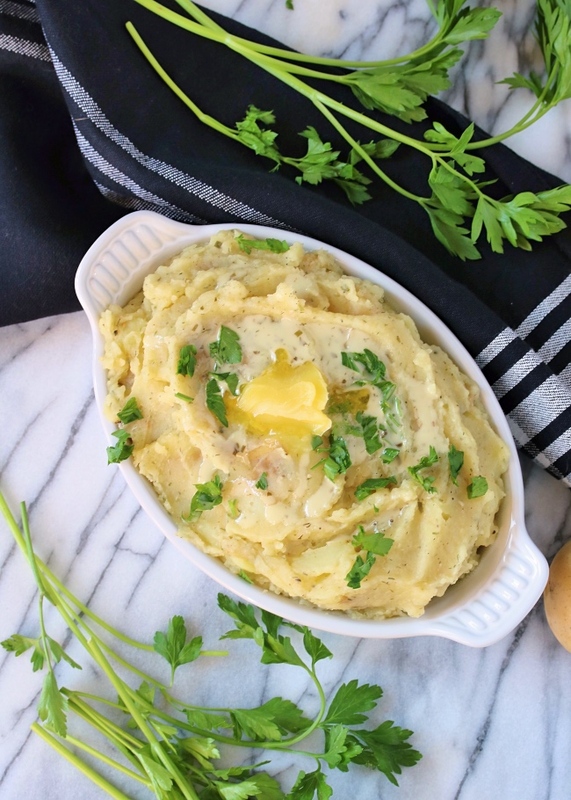 I hope you enjoy this easy, classic side- done nutrient dense & Whole30 style! See my notes below for adding cauliflower if you're up for it, and enjoy! 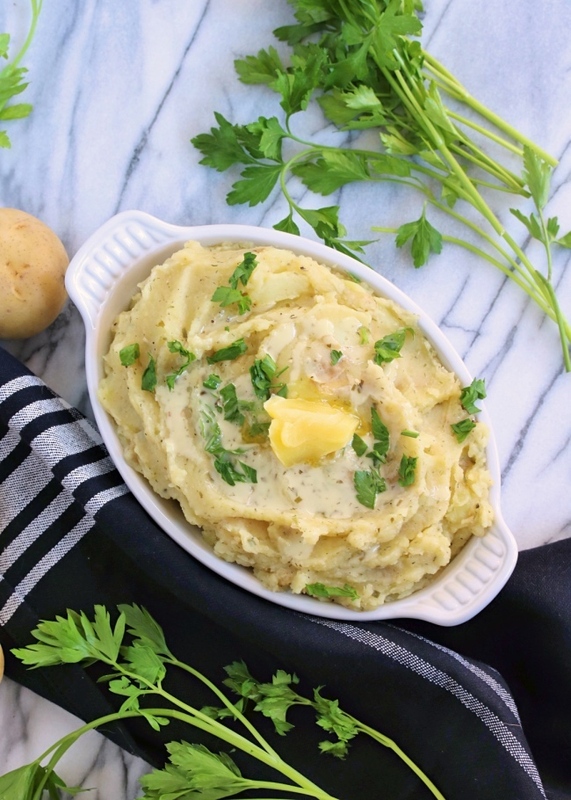 Place the cut potatoes in a large pot and fill with water to cover. Bring to a boil, then reduce to medium high (or a low boil). Cook until the potatoes are tender, about 15-20 minutes. Drain the potatoes, then return them to the pot over low heat. Add the chicken broth, ghee, coconut milk, garlic, and spices. 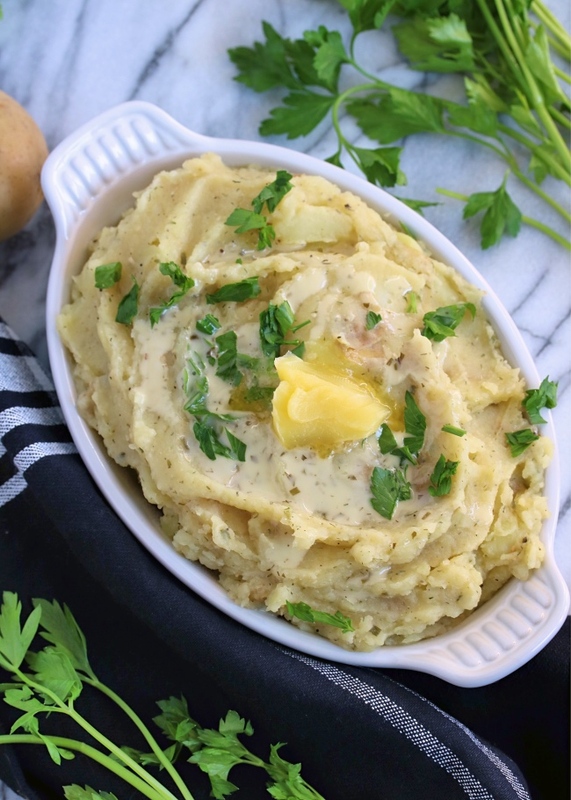 Mash with a large fork or potato masher until you reach your preferred consistency (I like to leave them a little "chunky"). Adjust the seasonings to your taste, and serve hot with optional garnish! You won't taste the coconut milk one bit in this recipe. But if you are avoiding it due to an allergy or sensitivity, you can definitely substitute cashew, almond, or whatever other milk you do well with! 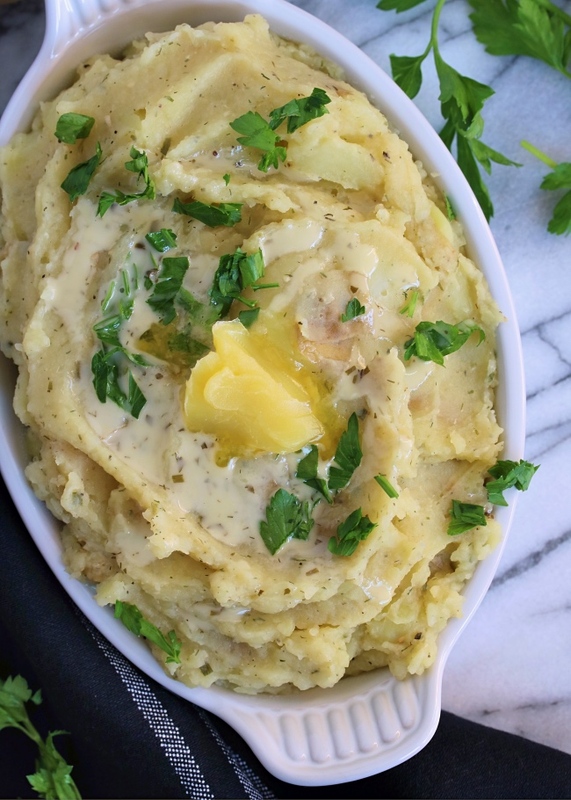 If you love super smooth mashed potatoes, an immersion blender works great for step 3! You could also transfer the whole mix to a high speed blender like a Vitamix. Trying to lower your carbs? 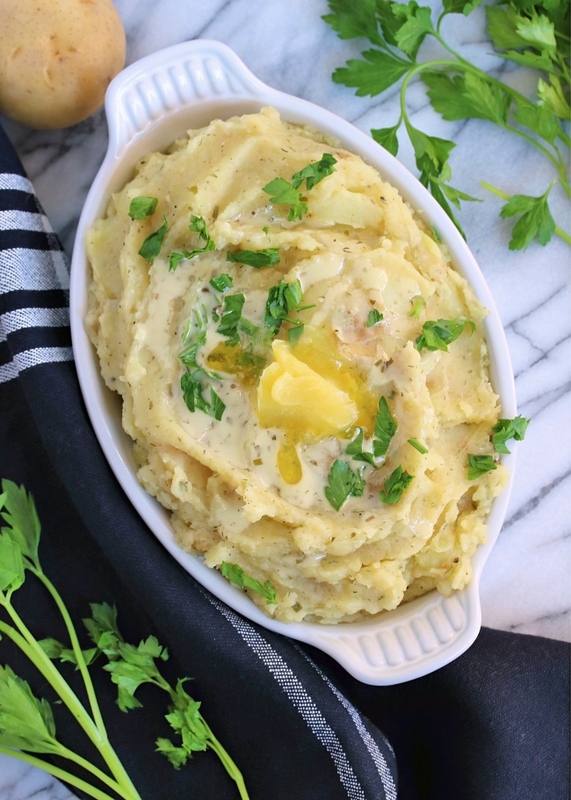 Substitute half of the potatoes with cauliflower- you'll hardly taste the difference! Where is the best place to find dried dill? It seems Dill Weed is more popular in Northern California.